Book 7 in Anthony J Melchiorri’s The Tide series. Even the oceans are no longer safe from the scourge of the biological weapon known as the Oni Agent. Governments struggle to stand under the weight of civilization’s collapse. Some remnants of human society have risen from the ashes. But the radical military organization responsible for the Agent has developed a new weapon more terrifying than their last. 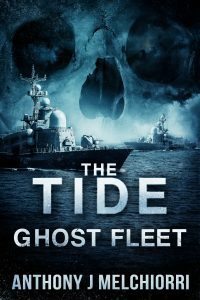 Rumors spread that a ghost fleet of ships have been commandeered to deliver the killing blow that will destroy any hope of humanity’s resurrection. Captain Dominic Holland and his group of covert operatives are charged with uncovering the whereabouts of the fleet and stopping them before they reach land. On a mission that takes them around the crumbling strongholds of Europe, they uncover a plot more sinister than they could have possibly imagined. With few resources and little time, Dom and his Hunters put their lives on the line to save the world from utter destruction. But even that may not be enough.